Co-organised by the Vietnamese Ministry of Culture, Sports and Tourism and the Cambodian Ministry of Culture and Fine Arts, the event is part of activities in the plan on culture and art cooperation between the two countries in 2018-2022. Speaking at the opening ceremony, Vietnamese Deputy Minister of Culture, Sports and Tourism Le Khanh Hai congratulated Cambodia on the success of the general election and the establishment of new Parliament and Government. 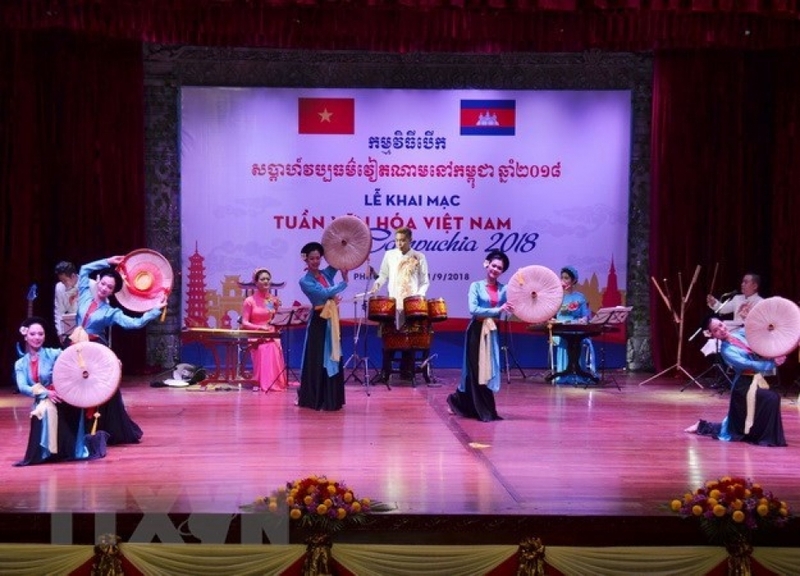 He stressed that through the event, Vietnam wants to introduce Cambodian and international friends to the value of Vietnamese culture, expressing his belief that the week will contribute to lifting the friendship and cooperation between the two nations and their people to a new height. For his part, Cambodian Minister of Culture and Fine Arts Phoeung Sakona highlighted the close relationship and cooperation across fields between Vietnam and Cambodia, affirming that the annually meaningful programme helps reinforce the bilateral relations. After the opening ceremony, Vietnamese artists from the Vietnam National Opera and Ballet, the Vietnam National Academy of Music, and the Vietnam Circus Federation (VCF) performed traditional songs and dances of Vietnam such as Quan ho (love duet singing), dan bau (monochord) performance, and Champa dance. In the same day’s afternoon, Deputy Minister Hai paid a courtesy visit to Cambodian Minister of Culture and Fine Arts Phoeung Sakona. The “Vietnam Culture Week 2018” in Cambodia will last until September 15. Besides Phnom Penh, the Vietnamese artists will perform in Battambang. Since the two countries established diplomatic ties more than 50 years ago, the multi-faceted cooperation between Vietnam and Cambodia have developed fruitfully, practically benefiting their people. Culture and tourism exchange programmes have been organised regularly, contributing to strengthening the solidarity and mutual understanding between the two nations.